Also requires Size 0000 (1.25mm) needles, size 11 seed beads. A few years ago, beaded knitting was the rage, and it seemed that everyone was knitting beaded amulet bags. Now Linda Taylor has used the same technique to make beaded bracelets and cuffs that are as comfortable as they are beautiful. Glass beads are strung onto fine cotton yarn, either randomly or in specific sequences, then stitches are cast on for the width of the wrist jewelry. 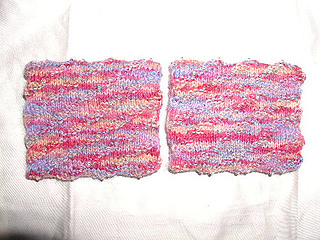 The piece is knitted in garter stitch to the desired length as beads are slipped up close to the needle in between stitches on every other row. The ends are sewn together and the jewelry is immediately ready to slip on the wrist (the natural give of the knitted stitches make this possible).